The payroll function in a company it’s one the most important tasks, an also one of the biggest expenses. Companies have to give consideration to payroll , to keep up to date with the payroll function has to be always correct, organized and with precision. 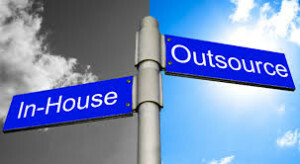 However companies can arrive to a question like, keep in-house the payroll function or outsource it? Usually keep in-house the payroll is the choice made, that’s why you only pay a fee for a payroll software, and you add a person attending that service, with all the adjustments and changes it can have. Nowadays, the payroll software has evolved a lot, is complex and sophisticated, so the person doing the payroll needs a previous training. Payroll reporting has changed too, and in many companies the employees can see the reports online. The most important thing when we keep in-house the payroll, is to solve a problem we might have, because it could be a big waste of time and money to find a late solution for our unwanted situation. Choosing to outsource the payroll does not mean, we don’t have any blame for an unwanted situation it might occur. Mainly, we are not exposed to all the keep in-house risks and plus more, we avoid to invest in training and payroll software. These are reasons why choose an outsourced service is a right choice. All we will have to do, is to provide a person with basic knowledge of the payroll function, who will be the connection with the outsource service. It is necessary a person in charge for making decisions. The outsource service has a detailed service level agreement, so we can contract the services we require from the outsource service, keeping in-house others. Beyond the cost, choosing a provider that can adapt with our company rigorously and easily, will be important details to make a good decision. Esta entrada fue publicada en Sin categoría el 18 diciembre, 2014 por spainational.